In the Los Angeles of the future, crime is rampant. So to help clear up the overly clogged judicial system, Senator Dilly (Aprea) institutes the American Computerized Judicial System. This basically consists of a robot, or android, or cyborg, or whatever (actually called a Tracker), that metes out justice right there on the spot, which means he’s just going to shoot you. Dilly’s bodyguards are Phillips (Wilson) and Ross (Norton). An underground movement of anti-robot revolutionaries springs up named the Union for Human Rights, who protest all of Dilly’s ideas and plans. When Phillips falls in with this crew, Ross feels he knows too much and the former co-workers become mortal enemies on opposite sides of the issues. What will become the nature of justice in America? Find out by letting CyberTracker tell you today! Here we have a cross between R.O.T.O.R (1988)., American Cyborg: Steel Warrior (1993), Abraxas (1990), and Future Force (1989), along with fellow PM vehicle Hologram Man (1995) and more mainstream fare such as Universal Soldier (1992), The Terminator (1984), Terminator 2 (1991) and Robocop (1987). But since it’s a PM, it has all the high-quality explosions and action/stunt setpieces they’re known for. And the movie as a whole is well-shot, in the PM style. So that prevents it from being your average sci-fi slog. 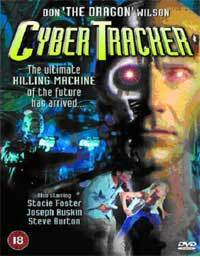 But, falling into a common trap of low-budget future movies, everything is written in “future font”, so you KNOW you’re in the future. Just see David Heavener’s Twisted Justice (1990) for further proof. That being said, the film drags once Phillips gets involved with the Union for Human Rights, but this is quickly corrected by the final fight between fan-favorites Richard Norton and Don the Dragon. Together at last, it’s really a fan’s dream to see them together. Their final fight is certainly worth seeing. Both Norton and Wilson show their prowess well in this movie, and it’s always fun to see that the many goons all think they can take down Don the Dragon. As the bodyguard of Senator Silly...er...I mean DILLY, Wilson looks especially like Lou Diamond Phillips here. And his character’s name is Phillips? Could that possibly be a coincidence? While the bald “judge jury and executioner” of the Tracker is a bit too ROTOR-y for its own good, it was played by Jim Maniaci of Timebomb (1991) and Cartel (1990) fame. Of the protestors, whose big gripe is that “Computers don’t have hearts”, Art Camacho appears. Wait until these people get a load of Apple. Hey-Oh! (to quote Ed McMahon). In another weird parallel, Phillips has a computerized companion in his apartment with a female voice named Agnes 1000. This is a lot like what Ed Marinaro has in The Protector (1999). 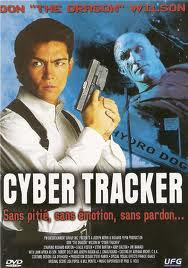 CyberTracker is a good chance to see two of the DTV genre’s leading lights in an offering by one of the top companies. Does it fulfill all the promise that description holds? Maybe not entirely, but you should probably see this anyway. What is R.O.T.O.R? I gotta check that out (I'm a sucker for periods). Speaking of 80's/90's computer flicks, ever seen D.A.R.Y.L.? It's not an action movie, but I loved it back in the day. If you love hilariously bad movies, R.O.T.O.R. is perfect! D.A.R.Y.L. was a lot of fun when i watched it! Would love to watch that again. It will be kind of dated, but that is part of the charm. I'm with you on this, I had it as a so bad it's good, with PM adding enough action to keep me interested. And R.O.T.O.R. is amazing, well worth your time. It was great to see Norton and The Dragon go head to head! One of the funniest parts of R.O.T.O.R. is any scene with Willard The Robot. Dammit. I missed an opportunity to pick up R.O.T.O.R. on video at a convention last weekend. I keep hearing about how epic it is. Oh well. Good stuff on the CyberTracker review. My favorite scene is when the chick gets grazed by a bullet and The Dragon takes his ENTIRE shirt off to wrap the wound. When she says, "It's just a scratch", he neglects to put the shirt back on. You can't go wrong with gratuitous shirtless Dragon. What convention did you go to? We have the Chiller Convention in New Jersey that is about 2 hours away from us, but usually worth it. As far as gratuitous shirtlessness, it kind of goes with the territory with action movies. Especially Van Damme and Lamas are the worst offenders. It was the Monster Mania Convention in Baltimore. I met John Carpenter, Anthony Michael Hall, and Zach Galligan (who does a killer Dice Man impersonation by the way). I'm thinking of going to Chiller next month if only to see Elvira, but I don't know if I'll be able to make it due to a shortage of funds and the fact that I'd probably have to fly solo. That is cool that you met all those great people. Chiller is worth going to, but it used to be much better actually. Reb Brown and Michael Pare are going to be at Chiller this year! Pretty good gets. This was indeed very fun, it may borrow from alot of other films, but that only makes it more nejoyable, the sequel is even better. Also I actually liked Digital Man and Phillip J Roth's similar output, like Prototype X2a. Venom: Will have to check out CyberTracker 2 soon. The best parts of Digital Man was any scene with Matthias Hues. Drive2: Can't agree more. This was a lot of fun! PM always delivers the goods. Van Damme is also a frequent gratuitous pantsless offender. I didn't know you were close to Jersey. I'm not, but I recently discovered the Springsteen album Nebraska. I loved every second of it. Thoughts? btw - sorry to keep posting random comments, first ROTOR, now Springsteen. We love random comments! No need to feel bad. We live in CT which is a few hours away from Jersey. As far as Nebraska, we don't have the album. We definitely agree his pants should stay on more often. In honor of his birth month, we are doing all Van Damme movies for the month of October.